Add Business Attendant & Extensions to your iPlum 2nd Line. Where do I setup my Business Greeting & Extensions? Give your callers a professional tone. Login online https://my.iplum.com & configure IVR / Auto Attendant. It is $0 (Free). You can add this feature to any iPlum local or toll free phone number subscription. There is no hidden cost. There is no contract at iPlum. Setup iPlum auto attendant & configure your extensions to dial your iPlum number. The callers will hear the greetings and by selecting your short extension they will be able to reach your iPlum number. If you don’t pick up it will go to your iPlum voicemail which you will be notified via email. 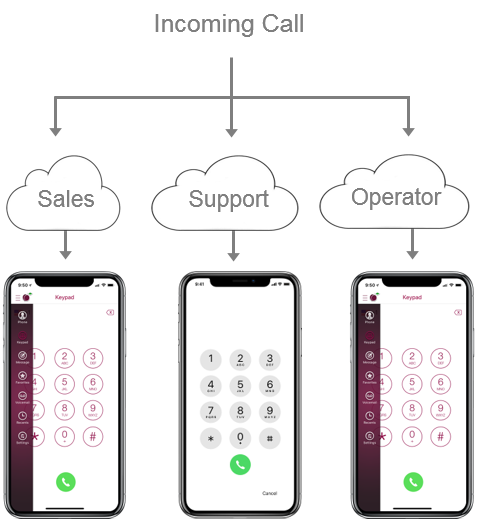 Create multiple departments with unlimited extensions ringing to same or different numbers (iPlum or external numbers). Setup main iPlum number and give each user their own iPlum number. Setup routing using iPlum Auto Attendant call flow. Login to your iPlum online account & get a new iPlum number or port-in your existing number. Add multiple users with their own iPlum numbers. Create extensions & link them to each iPlum phone number you have setup in previous step. You can setup as many extensions as you want. You can add multiple users to one extension as well. You can setup extensions to ring any non-iPlum number as well. When an outside caller calls your main iPlum number, they will hear the auto attendant greeting. They will press extension based on your auto-attendant call-flow setup. iPlum will route the calls to the appropriate user. iPlum uses text to life-like speech service to create your auto attendant free of charge. It uses advanced deep learning technologies to synthesize speech that sounds like a human voice. Alternatively you can upload a professionally recorded announcement as well. Welcome Greetings is played once when your caller dials your main number. You can create as many extensions as you want. You can set your extensions to be 1, 2, 3 or 101, 102, 204 or 1011, 1024 etc. It can also be a mix of single & multiple digits like 1, 2, 201 etc. You will define the maximum length of digits in Settings (default is 1). Make sure to match your Auto Attendant announcements with your extensions. Each extension can be set to ring single or multiple numbers. These numbers can be iPlum numbers, external domestic or international numbers. There are no restrictions. You can change extensions anytime. Can I have simultaneous or sequential ringing to multiple phone numbers? Yes, you can setup extensions to ring calls to one number or multiple numbers at the same time. These numbers can be setup to ring all at the same time or in hunt sequence one after the other. What does system settings mean? These are advanced settings which define various timers and count options. Maximum length of extension digits. Example: If you will be using call extensions like 1,2,3 ..9, you set the value to 1. If you will be using extensions like 101, 102, 103 etc, you will set this value to 3. Invalid extension tries before disconnecting the call. We suggest to keep it at default count = 3. Announcement replay before disconnecting the call. We suggest to keep it at default count = 3. Ring time interval between multiple sequential numbers in an extension. We suggest to keep it at default time = 18 seconds. Can I get iPlum phone system feature even if I am located internationally? Yes, you can get an iPlum phone system from anywhere in the world. iPlum makes that possible with our advanced communications platform. How is privacy built into iPlum? iPlum is a business class service. Unlike free services which share your meta data, we respect your privacy and fully protect your information. It is never shared with any third party or put into any advertisements. You get complete peace of mind.